Often people get caught in an excuse trap and don't even realize it. They give up on accomplishing important goals or fall behind the competition without knowing about simple steps that get rid of the excuses that hold them back. Excuse management techniques can change their lives and help them go farther faster. Why did you write a book on excuses? Do people have different excuse styles? What can happen when you discover the reason behind an excuse? What are some of the most unusual excuses you've heard? How can you stop your own excuses? 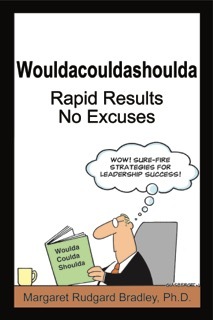 If you are leading a team, what can you do to prevent members from making excuses? What are the different types of excuses? Can an excuse ever be a good thing? When are people most likely to make an excuse? Are there any statistics on excuses that you came across when you did research for Wouldacouldashoulda? What should you do when you hear an excuse? Are there any words to keep in mind that will prevent you from making an excuse? Clients said: "Zim. Zam. Zoom. My team took off like a rocket after one of her workshops." and "Margaret's book made me want to dance in my pajamas." Forbes featured an interview with her about leadership that avoids the blame game. Our clients are busy executives who care about achieving and sustaining optimal performance and satisfaction.